Starburst is a 5 reel, 10 payline slot game with a 96.1% RTP. This UK Online Slot comes with Sticky Wild Respins Feature. Conquer the cosmos with the bedazzling slot game from NetEnt bet from as little as £0.01 or spin with £100 stakes on the 5 x 3 reel slot offering a 96.09% RTP. Play Starburst on Money Reels today which is home to over 550+ slot games. Our other top games include Rainbow Riches, Bonanza, and Wolf Gold. If you’ve got a taste for space exploration, or just fancy your chances of grabbing the life-changing jackpot Starburst is one of the best slots hosted on Money Reels to spin the reels on. Although the game may have been published in 2012, it remains as popular as the games brought out later in the 21st century thanks to the futuristic feel of the slot, which at the same time cleverly incorporates a sense of nostalgia. Anyone who has ever spent time playing Bejewelled in their youth are sure to appreciate the bedazzling jewels which act at the symbols on the 5 x 3 reel set up which gives you ten fixed pay lines to play on. While ten pay lines may sound like they’re not enough, there are plenty of other features which make Starburst well worth your time. Even though there are plenty of online slots which take the space theme to the next level, the simplicity of Starburst most certainly works in its favour, there are no flashy in your face animations combined with harsh sound effects. Play at a fast pace, or simply take your time spinning the reels and enjoying the laidback feel of Starburst. The game is set to a purple intergalactic backdrop with streams of stardust glistening in the background and the reels take up most of the screen with the transparent setup. The symbols appear larger on the screen that is generally seen on online slots to help make the gameplay that little bit more immersive. There is much less of a distinction between the background and the reels and while that doesn’t sound like it should impact an online slot game all too much, you’ll be surprised at how immersively cathartic the game can be. Starburst is also an absolute audiophile's delight, the transiently peaceful music to the online slot will give you a bit of an X-files vibe, yet, at the same time, the sticky-sweet synth melodies will provide you with a hit of catharsis as you spin the reels. The symbols on the reels are all different sparking jewels, whether you play on your laptop or a handheld device, you’re sure to appreciate how much effort NetEnt put into making sure that Starburst was an aesthetic treat! 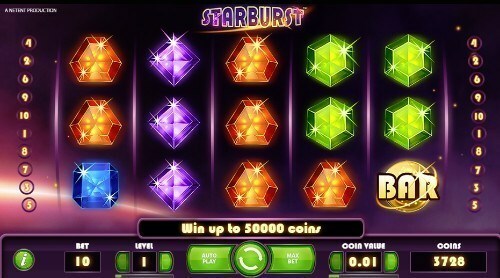 There are five different jewel colours; in ascending order of value they are purple, blue, orange, green and yellow, but Starburst also kept the memory of the traditional slot machine alive by including the ‘bar’ and 7 symbols. The wild of Starburst is simply the ‘Starburst’ logo which can help to boost your chances of winning. Not that Starburst is an online slot which needs much encouragement to pay out. You’ll have noticed that there aren’t many symbols on Starburst, this means that as there are fewer symbols to match, the chances of you striking a winning combination on the reels are significantly higher than other online slots which have plenty of high value and low-value symbols to match up. This also makes up for the fact there are only ten different pay lines to play on, it was a unique approach by NetEnt which may not seem statistically appealing, but once you pair the chance to win a huge amount of money with the high return to player rate, it more than makes up for it. When it comes to Bonus features on the Starburst slot, there isn’t an awful lot to be said for the fast-paced game. NetEnt kept Starburst relatively simple, yet, they also cleverly included features to Starburst which haven’t been seen with any other online slot. Sadly, this technically does mean that there is no free spins feature. So, just how do you get the chance to win the life-changing amounts of money on the visual treat which is Starburst? That would be by landing three expanding wilds on the reels. If this happens, you have the potential to win anywhere up to £50,000! Plenty of reel spinners have cashed out on four-figure prizes, it happens much more often than you think! However, most of the wins will usually happen during normal game play where prizes of 300x your stake amount aren’t all too uncommon! Considering that you can place a bet from 10p to £100, that’s a significant amount of money! NetEnt have been the pioneers of online games for the last 20 years. Very few game designers have the ability to keep up with the ingenuity of NetEnt’s games. They have long been a trusted supplier of casino games for online casinos thanks to their cutting-edge releases and premium content. They have developed a strong corporate identity which constantly sees them meeting the customer’s expectations at the same time as creating out of this world designs. While many game developers may claim to be the best, there’s no arguing with the impressive stats which NetEnt boast. Through their games they have received over 41.2 billion transactions between 2017 and the start of 2019, and they have one of the biggest most extensive portfolios around with over 200 HTML5 online slots in various different themes. While games such as Starburst may serve to appease slot players looking for an immersive yet simple online slot experience with no particular theme, NetEnt have gone above and beyond with their niche slots and have even dedicated some to popular rock bands such as Guns n’ Roses. It should probably come as no surprise that NetEnt have gone global, while they started out as a small operation in the beginning, they have now employed talent from all over the globe including Sweden, Malta, Ukraine, America, and Poland. Now, NetEnt are seen as the greatest innovators of the online slot industry. As there are literally thousands of online slots, usually finding similar slots isn’t an issue. Yet, there really aren’t many which can offer the same progressive jackpots, unique features and high RTP, nevertheless, NetEnt have created some fantastic online slots which are remarkable in their own right. Berryburst shot is one of NetEnt’s most recent online video slots which was released in 2018 and puts a fruity twist on a similar set up to Starburst. Instead of playing with jewel symbols, the symbols will include juicy fruit such as grapes, oranges and limes to create one of the tastiest looking slots we’ve ever seen. The 5 x 3 reel set up offers a return to player rate of 96.56% and has a low – medium volatility. The wilds and expanding wilds which give you free spins are very similar to what you will enjoy whilst playing Starburst, it would be no surprise if NetEnt used the same game template for Berryburst, yet, there’s still no better slot to mix it up with if you’ve grown tired of Starburst! If you feel like sticking with the space-themed slots, Cosmic Fortune is yet another stellar release by NetEnt. The slot is playable from 15p a spin with a maximum stake amount of £100. There are plenty of ways to win on the game with 15 different bet lines. And there’s not just one progressive jackpot with the ability to change your life, there’s three! While Berryburst and Starburst had the exciting feature which allowed you to make shapes of the symbols, Cosmic Fortune has include a fun avalanche and free fall features which can help you to win out big! The free feature was enjoyed by anyone who played NetEnt’s flagship game Gonzo Quest, all it takes to trigger it is three of the scatter symbols landing on the reels. Any fans of the 80s are sure to appreciate the Neon Staxx online slot by NetEnt, the glam futuristic vibe of the slot takes the visuals up a notch from what NetEnt created with Starburst and provided you with a neon delight. The Super Staxx feature joins other features such as the wilds, scatters and free spins. For reel spinners who prefer to play with more bet lines, Neon Staxx offers 60 different ways to play, but it has also been created to be enjoyable for people looking to play on a budget with minimum stake amounts of 0.2 coins. The symbols on the game are different predatory creatures including tigers, eagles, jaguars and lions with the lions being the highest value symbol. There’s also up to 20 free spins up for grabs. There is certainly no shortage of space-themed online slots online today. Many game developers tried to match the magic of Starburst, while it is still the most popular slot of its kind around today, there are plenty of other good options from other game developers. We’ve picked out the four best games from NetEnt’s rivals to help you find the perfect slot for you. Remember the iconic Tim Burton 1996 film Mars Attacks? Now you get to relive the magic and feel your blood chill as you hear the terrifying ‘Dag Dag’ taunts of the aliens as they make their attack on earth, and this time, Tom Jones isn’t around to save you! The Mars Attacks game by Bluecrest was released in December 2018 and treats you to a more sci fi experience than you got with Starburst, the graphics are little darker, but the animations in the game will be enough to intrigue console players. The intro to the game treats you to the fact that we are being watched by creatures from another world, before the screen shows an alien asleep as they watch various locations around the world. Aside from the spectacular theme of Mars Attacks it also offers a Return to Player rate of 96.44%, a medium level variance and 20 different ways to win over the 5 x 3 reel set up which gives you the chance of winning a max coin jackpot of 250,000. 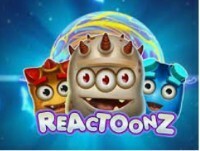 Reactoonz is yet another adorably alien slot which is a great alternative to the Starburst online slot. There are no pay lines to the game which uses a 7 x 7 grid, instead Reactoonz is a cascade style slot game, wins are made by landing clusters of symbols in certain patterns. There are also plenty of special features which helps you to experience higher and more frequent wins on the medium variance game which can offer you a serious jackpot win. Whether you’re playing from the minimum stake amount to the maximum of £100, there’s a 4750x multiplier to enjoy, not many online slots are generous enough to offer such a high multiplier. It would seem that the only real downsides to Reactoonz are the lack of free spins and the main bonus feature which is the Garagantoon feature rarely pays out. Yet, there are still plenty of reasons to give Reactoonz a go including the random wilds and the stunning high definition graphics. The latest in the Astro Legends series was released at the end of 2018 which has a very unique set up and plays in a similar way to Reactoonz, but what really sets Astro Legends: Lyria and Erion slot apart from the other space-themed games is the stunning synth soundtrack which accompanies the riveting story behind the online slot. Foxium went above and beyond when they created the video slot which takes place somewhere out in outer space. Instead of playing over a standard grid, the reels are in the shape of a horizontal diamond, winning combinations happen when clusters of matching symbols are landed. There are only six standard symbols on the game which makes the chances of you striking a winning combination even higher. Astro Legends also offers wild cards, a sonic re spin feature and the super special Lyra Spirit bonus. Starburst Gameplay on Mobile vs Desktop / Laptop. It’s no secret that the Starburst slot is one of the most visually pleasing games out there, and this rings true whether you are playing on mobile or on your desktop or laptop – just make sure that you crank up the volume so you can appreciate the soundtrack to the game! By visiting the NetEnt website you can see how you like to play the game best in the free play mode. You’re also able to play Starburst in touchscreen mode which has won the slot massive amounts of popularity. If you are playing Starburst it is recommended that you play in landscape mode as that is the only way that the game will fill the screen. It is a little annoying that the spin button appears over the reel on the landscape mode even if it does disappear when you hit spin. Not a lot of online slot games make the news, yet, Starburst is not your average online slot. Here are just a few of the reasons why NetEnt’s game has made the news! “Rather than coming out with yet another ripoff of a physical Slot, NetEnt decided to switch gears and offer to the world a completely new game that no one ever played before. And that's how the Starburst Slot machine was born. In an analytical study carried out by Fortitude Magazine, Starburst came up as the second most played online slot game in 2018 according to Google! There were plenty of big wins for players of Starburst in 2018, one lucky winner cashed out on the jackpot amount which gave them a life-changing sum of money to the amount of £32,000.